Can you imagine packing up your family and moving abroad? The thought may very well give you a slight panic attack or it may induce a little spark of curiosity. Either way, our new series, Families Around the World, will give you a sneak-peek at American families who are living abroad — from far off exotic places such as Abu Dhabi in the Middle East to the bustling metropolis of Rome and everywhere in between — stay tuned for a look at what life is like raising a family away from home. Can you imagine packing up your family and moving abroad? The thought may very well give you a slight panic attack or it may induce a little spark of curiosity. Either way, our new series, Families Around the World, will give you a sneak-peek at American families who are living abroad — from far off exotic places such as Abu Dhabi in the Middle East to the bustling metropolis of Rome and everywhere in between. Stay tuned for a look at what life is like raising a family away from home. “To be completely honest, we moved [to Japan] on a whim,” Jewell Willett shares. 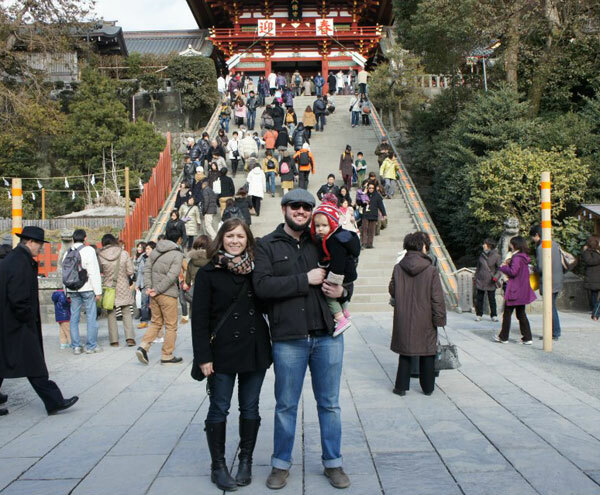 She and her husband, Brandon Willett, moved from San Antonio, Texas to Japan two-and-a-half years ago in pursuit of finding careers that they both loved. Brandon took a job with an American restaurant chain in Japan, where he is now General Manager, and after spending some time exploring their new home, Jewell now works as the USO Japan’s Programs and Marketing Director. And, they both share the most important job of all — being parents to 16-month old Ella, who was born in Japan and knows it as her only home. If you could imagine the two most opposite parts of the world, it’s possible that Japan and Texas would come to mind, so just imagine Jewell and Brandon moving from a state whose unofficial motto is “Everything is bigger in Texas” to Japan, where space is not to be taken for granted. The results — a 200 square foot apartment that they called their first home and that eventually became their home as a family of three. Between the 300 stairs it took to climb to that tiny apartment in Sasebo (a smaller town where they lived before moving closer to Tokyo) and the humidity from arriving in Japan at the end of a month-long rain, it was very apparent that they were no longer in Texas. 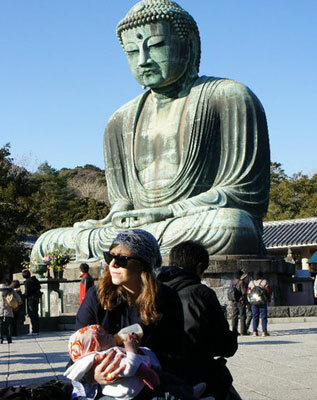 For Jewell, giving birth in Japan seemed to be a far cry from what she would have experienced giving birth in America. At 10 days overdue, Jewell headed to their birthing clinic, which they’d carefully chosen, along with their doctor, to be induced. In America, that would typically mean being hooked up to a Pitocin drip and waiting out the ride, but in Japan, being “induced” meant helping things along naturally by inserting a “balloon” to, well, get things stretched out a bit, which was later switched to a larger balloon as things progressed. Soon after Ella was born, the Willett family moved into Yokosuka, near Tokyo, taking them from the rice paddies, farm land and trees of rural Japan to trains, Starbucks and the dense population that you imagine when you think about Tokyo. Ella attends Japanese day school during the week, while Jewell and Brandon are at work. At school, Ella is in class with six other children her age, where they spend the day playing logic games, exercising and learning to be “domestic,” doing tasks such as learning to pour juice, use chopsticks properly and wash their hands. Even as a toddler, Ella is fully immersed in Japanese culture. She bows and insists on taking off her shoes when she enters a home. Ella’s first words were all Japanese, although she speaks both Japanese and English. When the three of them find time together on the weekends, they typically plan an adventure to explore somewhere new — they can easily travel by train to other nearby cities — or check out their favorite spots in Tokyo. An end to lap travel on airplanes?